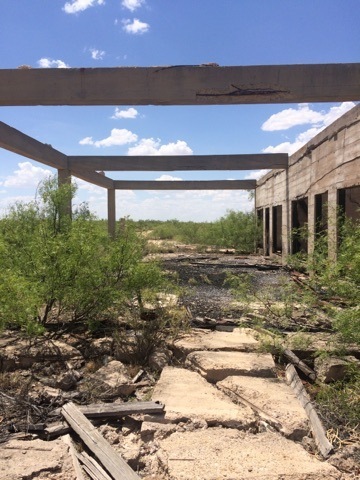 Girvin, Texas, Pecos County ghost town. To avoid confusion, there are two Girvins. 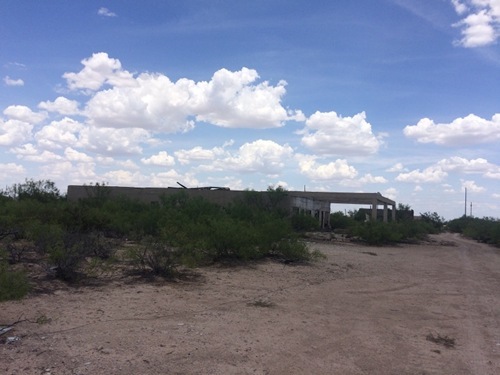 One is a cluster of buildings at the intersection of Hwy 67 and FM 11 and the other is about one mile North on FM 11. You can get a beer at the first one, but if you see someone at the other one, check to see if you can see their reflection in your car's mirror. 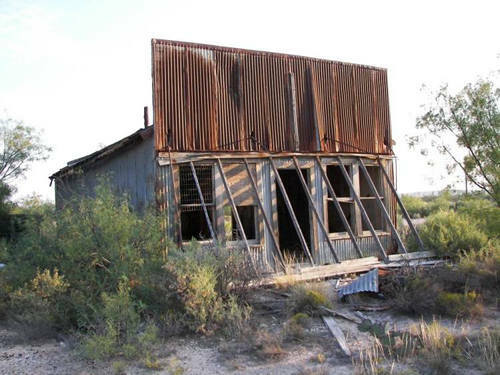 Girvin is listed in T.Lindsay Baker's Ghost Towns of Texas. According to this excellent book, Girvin was named after a ranch that was there when the railroad came through in 1911. The post office followed in 1912 and Girvin was officially named. It prospered for about 20 years and then started its decline. 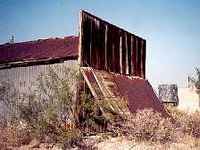 It served as a shipping point for cattle and as a receiving point for oil drilling supplies. 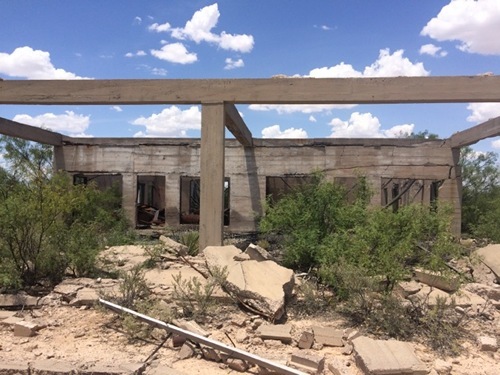 Mr. Lindsay reports that the number of students increased so fast that the new brick school was inadequate even before it was finished and some classes had to be held in a nearby lumber yard. A new highway (built just a mile away) and the Great Depression stopped Girvin in its tracks. 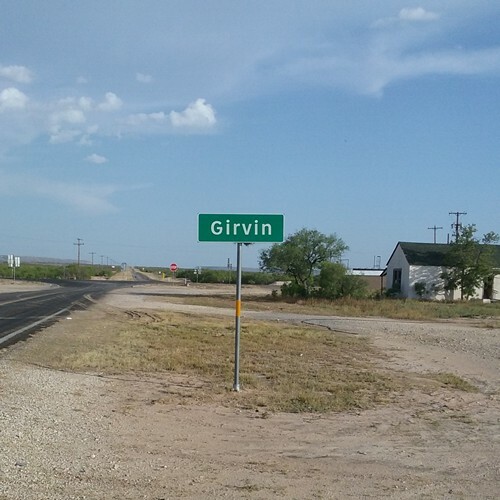 Girvin was on our route from McCamey to Grandfalls, but we stopped not because of its ghost town status. We stopped because it is also included in Counter Culture Texas. (Click for our review.) Evidently we are not alone in our appreciation for this book. We've noticed that in most bookstores, the clerks have had the good sense to place the book with its cover visible. Here is one book you can judge by its cover (but just this one). The "Old Town" Girvin (one mile north) has lost the combustible parts of the only two story building to the arsonist's torch; a reminder that even ghost towns aren't immune to change. The Girvin Social Club is the most poignant story (in our opinion) in this volume full of characters, gentlepeople, places and food and how they all come together. We pulled up as the sun was going down. The Girvin Social Club was closed. We felt relieved, since there's nothing more to say that isn't said in Susie Flatau's chapter. Update (Sept 12, 2000): We found ourselves passing Girvin less than a month after our first visit and this time the parking lot of The Girvin Social Club was full. Dear TE, I just found your website and I was so happy to see that you had a page on Girvin, Texas. My mother, Midred Helmers was postmaster for Girvin for thirty three and � years and she was the reason that Girvin was moved from the old site on the railroad to where it is now located on Hwy 67. She and my father, Arno Helmers moved Girvin in 1956 when Hwy 67 was becoming the road to travel. They purchased the old railroad depot in Girvin and moved it for our family to live in and for the Girvin Store and Post Office. After what seemed like a long time, the depot was moved and remodeled for our family of Mildred, Arno, big brother Stanley, big sister, Janice, myself, Arna and little brother, Johnny. I have just discovered your [magazine]. I began to read and soon realized two hours had passed. What a great collection! I read your [page on] Girvin, Texas. I spent one of the most memorable eveninngs of my life in Girvin in about 1992. 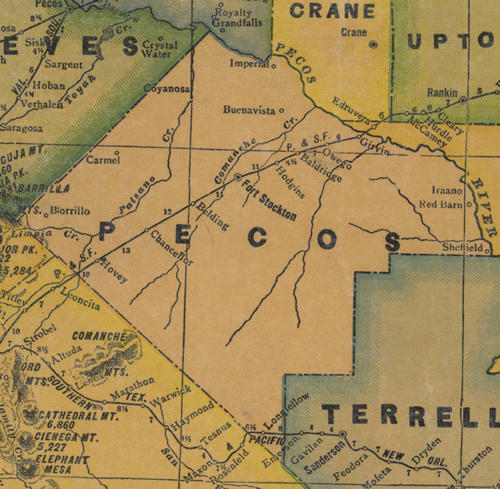 National Geographic magazine had done an article on the Pecos river that included "New" Girvin and the Girvin Social Club. The minute I saw the picture, I knew I had to go. A couple of years went by, and I finally decided to make the trip. The story of that evening is a long one, and I will spare you that, but suffice it to say that I, along with a new aquaintance named Ernest (a sheep rancher) and about a half dozen other nearby residents had quite a time at the Social Club that evening. What prompted me to write you was another story written by one of your readers about Girvin that included a reference to the Helmers Store. Several years after my evenings initiation to "The Club", I returned once again with a woman I was dating at the time. She loved the place as much as I had. We met a young man named Thomas Helmers. He must have been about eight years old or so at the time in about 1996 or 1997. The name didn't mean anything to me at the time, but this young man has remained a part of my memories since then. We talked with him for quite some time, and he was quite taken with my girlfriend, Lisa. At one point, he stood and disappeared into the back room of the Social Club. He returned with a basketball...obviously new and quite precious to him. He signed his name in an eight year olds scrawl requiring much brow knitting and tongue movement and presented his treasure to Lisa. She beamed with gratitude and was quite touched by this show of selflessness. I'm a displaced Texan, living in CA with the military. 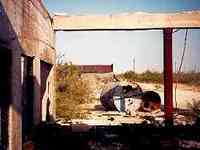 I was so happy to see all the pictures you have of the small West Texas towns that my family originally hails from. Glad to see you are attempting to keep history alive. I was especially happy to see the section on Girvin...my family still owns property there. The picture that you have on the last page of the Girvin section used to be a gas station. My grandfather, "Red" Nutter, was born in the upper portion, where his parents were living at the time.